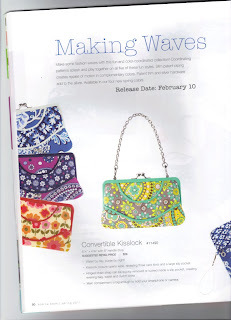 I bet you are wondering what kind of specials Vera Bradley are going to offer in the Spring, so I did a little research and this is what I found. If you know something different just leave a comment. Kick off the arrival of four new colors. 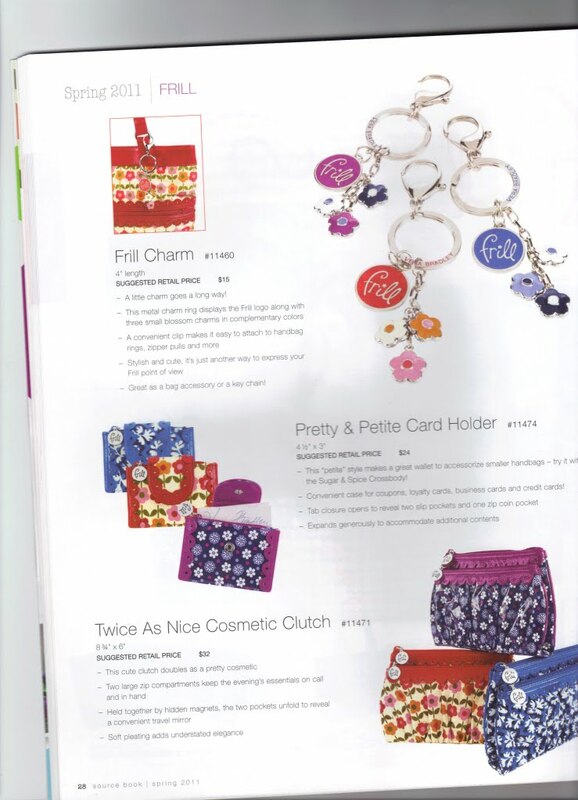 One free coin purse per customer while supplies last. 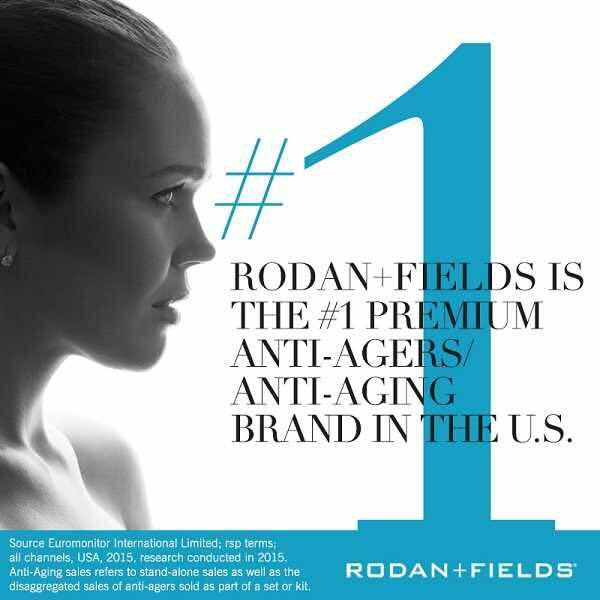 Purchase this in one of the new spring colors for $18 ($28 value). A great piece to hide a Valentine’s Day treasure! 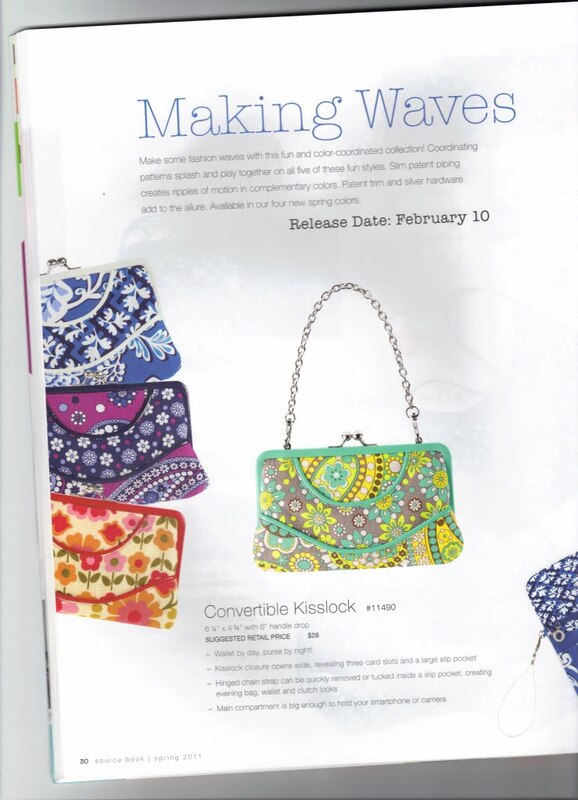 To kick off the arrival of the Beach Collection, you can purchase a pair of Vera Bradley flip flops for $12 (regular $24) with the purchase of a Vera Bradley beach towel. To kick off the arrival of the Dockside Canvas Collection,you can purchase this Limited Edition piece for $16. Thought it was Symphony in Hue from across the store. Well, Goodwill has a Tea for One from Hallmark for only $1.99, that seems like a better deal. It is Christmas themed though. I was looking for something a little more timeless. Was looking for a Tea for One set and found a couple at Barnes and Noble. I couldn't find the display because it was awkwardly behind the register. 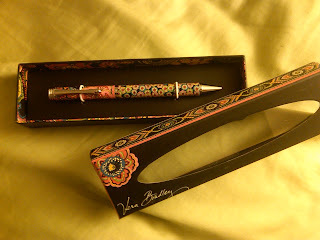 So today is one of those days where I am not really going to blog about Vera Bradley stuff. Instead I am going to ask you for money, yep that is right, ask you for money. If you are looking to make a last minute tax deductible donation before the end of the year I hope that you will consider donating to the Susan G. Komen 3 Day for a Cure. I have signed up to participate again in 2011, which will be my 3rd year walking! To find out more information about why I walk or to be one of the first to make a donation, please visit www.the3day.org/goto/alison I hope you will help me reach my goal of $2,500! Below is a picture of me and my friend Brenda...we are dressed up at Sheri's fairies in memory of our friend we lost to breast cancer in May. It is hard to see because I have so many pins on it, but I am sporting my Cupcakes Pink Lanyard! 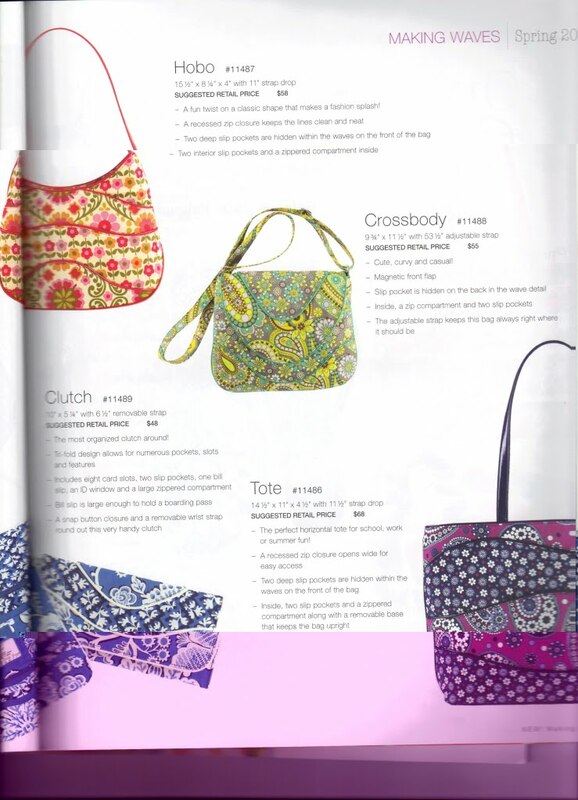 Vera Bradley Special Collections are now up to 40% off. 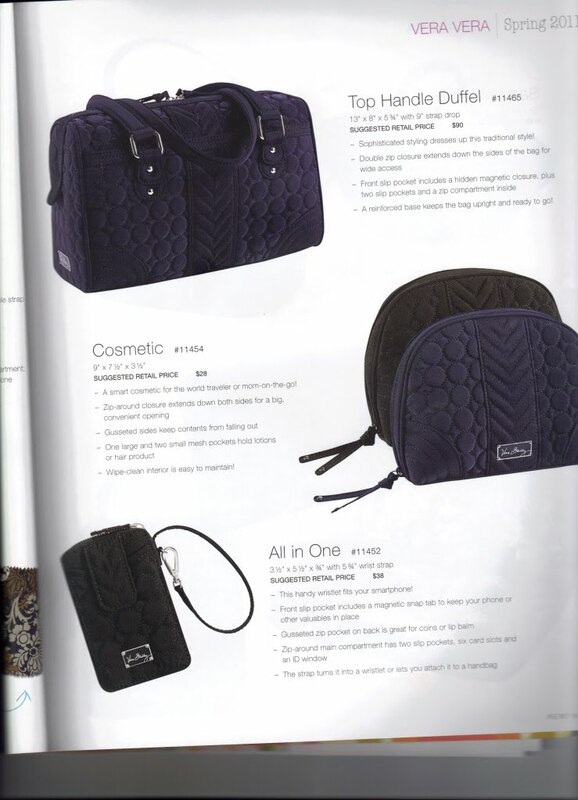 This includes: Canyon, City Sport, Wildwood Park, selet Frill, Holiday Gifts and Crossroads. There are some great deals available right now! Guess they are making room for the new releases that start on January 13th! Day 3 of being a tourist in my own city. Saw an imposter at Sea World! It blends in with her jacket, but I saw a Caffe Latte Bowler on 16 and Pregnant. I don't know why, but when ever this show is on when I am flipping through the channels I have to watch. I am out shopping with mom today and we were driving by Steinmart, so we stopped in to see if they have any Vera. They just have a little bit. Puccini handbags for $24.99, All in One Wallets for $14.99, Mini Zip Wallets for $12.99 and Pocket Wallets for $9.99. The only colors are Puccini, Razzberry Fizz, Mod Floral Pink, Mediterranean Blue and Mosaic. I took this picture last Friday when it started raining in San Diego. We hadn't received much rain yet, so it was nice to have some different weather. It did change our plans because we were going to go to the zoo to experience Jungle Bells and check out their Christmas activities, but since it was raining we decided to go to happy hour instead. 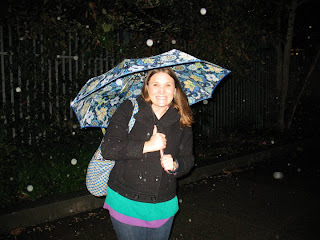 As we were walking from work to happy hour Joyce snapped a picture of me with my Vera and Umbrella. I posted it on facebook, so some of you might have already seen it. Well, it is still raining in San Diego! Today is the 5th day in a row! I can't remember it ever raining this many days in a row. It is rough out there. Yesterday the gutters on my street were so full of water that the water went out at least 3 feet from the gutter into the street. I had to cross the street to get to my car and I tried to jump across the water...but ended up in the water. My mary janes got flooded with water, not fun! Next time I go to my parents house I am for sure grabbing my sister's rain boots. I dont want to end up in anymore urban rivers. HAHA. Updated: Took a picture when I got out to my car. 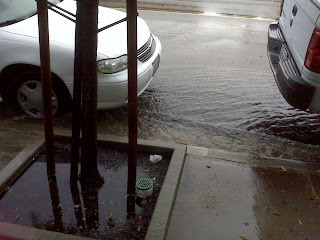 It is kind of hard to see, but the water in the gutter goes out past the driver side of my car! Good thing I was parked on this side of the street though...I just climbed through the passenger side. Hope you are all staying dry! Um, can you believe that Christmas is a few days away?!?! Last Sunday I was up at my parents house and I had a lot to accomplish. I hosted a cookie exchange last night, so I need to bake cookies and had a few arts and crafts projects that I wanted to work on. 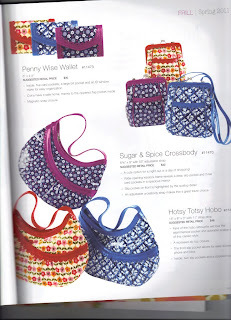 One I found on Inside Stitch, the Vera Bradley Blog. They had a wreath that they made out of their wrapping paper. Chick here to see their wreath. I didnt have any Vera Bradley wrapping paper and no gift shops nearby are carrying it, so I made it out of Christmas scrapbooking paper. My mom and I each made one! I did have to add a little VB to it, so I used one of the white ribbons that they use to tie around packages as by bow. It turned out pretty cute. Maybe next year I will make the Vera Bradley version. I also made a garland out of felt that was super easy. I cut circles out of felt and then sewed them all together. I used red, green and pink...it is pretty fun. I hung it over a mirror in my dining room. I baked two batches of cookies as well. Almond Bonbons, which have almond paste in the middle of a cookie...super yummy and Almond-Coconut Macaroons...I think that these are my favs. My friend Kristin did a little Christmas shopping at the Vera Bradley store! I am selling some stuff on ebay this week. I have two auctions that end tomorrow and a few that will end next Sunday. I probably should have listed this stuff at the beginning of the month for all of the Christmas shoppers, but I didnt get around to it. Plus it is easier to list things at my parents house because my mom has a scale and a bunch of boxes (a closet full). So I can take photos, pack it up, weigh it and list it. I probably should buy my own scale, but since I dont sell that often I will probably just keep my system of packing stuff up and taking it to my parents house. 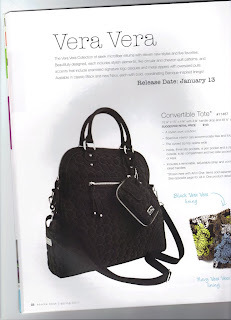 The two Vera Bradley items that I have that are ending tomorrow are a Pink Pansy Tote and a Java Blue Photo Book. Last night I added two checkbook covers, one in Bermuda Blue and the other is Piccadilly Plum. The other stuff is really misc. If you are in the mood for a little shopping you can check out my ebay listings by clicking here. Vera imposter at Wallgreens spotted by Melissa. Last night was my company holiday party. It was really nice...gorgeous hotel, delicious food and good company. Plus I love getting dressed up. I was dashing around all day, I worked in the morning at my full time job and had to leave early to work my part time job, and then leave that early to make it to my holiday party an hour late. Hopefully you followed all of that. I packed up all of my stuff in my Miller bag and I was set for the day and my two outfit changes. I was going to just carry my Anastasia Villager but decided that since I was dressing up, I should take a dresser bag, so I dug out my microfiber clutch. It worked great because it fit in my Miller all day and then I grabbed it for the party. Some of my co workers even noticed! Haha. They liked it, said it looked more modern and young, which I thought was funny, because to me microfiber looks like something for the older crowd, although I have been tempted to pick up a few more pieces. So this morning I had some stuff left in my Villager and some in my clutch. I need to move it all to a Saddle Up because tonight I am going to the zoo for Jungle Bells. No time to swap out bags before I left for work, so I threw the Villager in the bottom of my Vera, dumped the clutch contents into the Villager then threw my mittens and Saddle Up on top. Only to head outside and see that it is sprinkling. 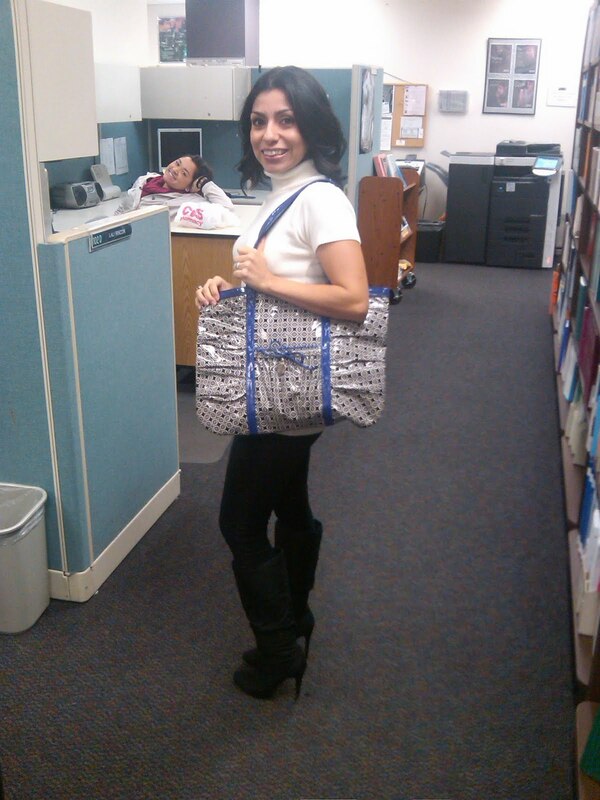 Grabbed my Mod Floral Blue Umbrella, added it to the bag and dashed to work. My Vera has never been so unorganized, haha. Hope your day is more organized than mine! While you are there you can pick a Winter Wallpaper for your computer...click here for the link. I am ready for the progressive potluck at work today. I have everything all packed up. My department has appetizers. I made bacon wrapped bread sticks and spinach artichoke dip. I had a lot to pack up to bring to work, so I filled up my Super Tote with bowls, bread and crackers. The Boat Tote is getting some use today to carry my crock pot, dip and the bread sticks. I love my boat tote just as much as my Veras, it is so sturdy and good for heavy stuff. I have a medium size and a large one and they have my name on them...bonus! Also the weather finally got cooler in San Diego. It was been 80 degrees all weekend, but it is cloudy today. Feels a lot more like winter now. I can't wait for Christmas! You are just going to have to trust me, that is a Jave Blue Miller. She was running fast and the lighting at kickball isnt so great. I saw the FedEx ground truck pull up out front at work, met the driver in the hallway and followed him to the mailroom. First thing that Alfredo does while the driver gets my box out of the stack...hands me a box cutter! Oh happy day. 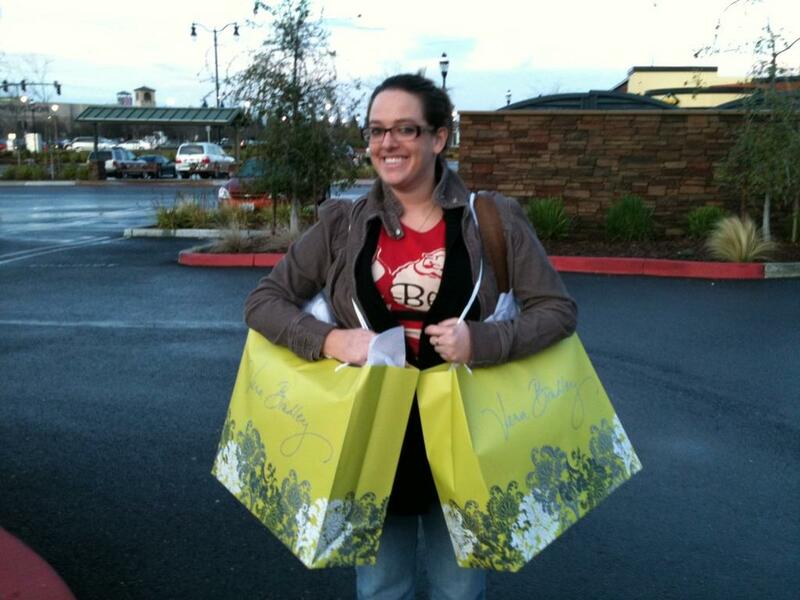 My friend Amber also got the $20 off holiday coupon. It is times like this when I wish I lived closer to Amber and the Vera Bradley store. Amber picked up a couple of great items...one of which I also think about purchasing, but just never have. A Symphony in Hue Pen. I always think that I need a pen, but I never buy one. This one is really pretty. 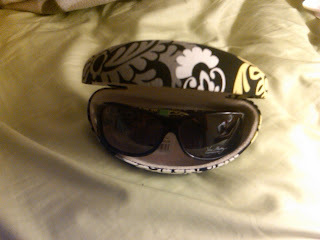 She also picked up Holly sunglasses in Sittin in a Tree and a Baroque Sunglass Case. I love my VB sunglasses. I would have 3 pairs if one of them didnt fall into Mission Bay. so now I have 2 pairs. Botanica Backpack while out Christmas shopping. It was a well loved backpack. I kept the commentary light when I posted the pictures, but I thought that it might be nice to do a little recap. Get ready ladies because these new styles are going to be coming fast and furious once the new year starts. I am not sure if you noticed all of the release dates, but they are releasing at least 2 lines a month! I am pretty excited about a couple of the new styles. I picked what I think are going to be my favs and a few that I probably wont even look twice at. 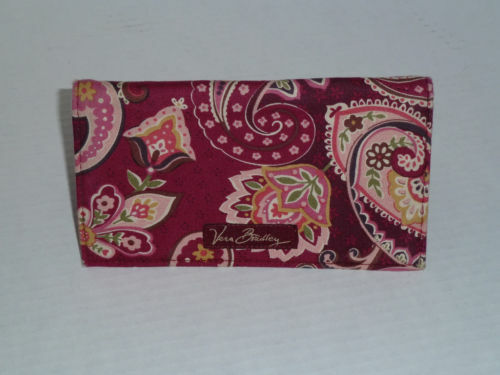 I have been waiting for the Gallery Wallet since I started buying Vera Bradley! 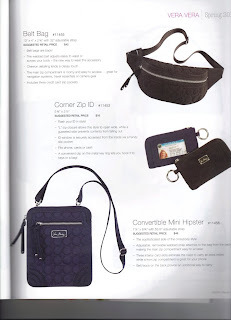 This is the style wallet that I have always used. I think the thing that I like the most about it is that my money lies flat and there are lots of spots for cards. When I first started carrying VB it seems like the Mini Zip and smaller styles were all there was to pick from. Of course the Zip Around and been a while a long time, but it just never seemed like it holds a lot. I was excited for the Turnlock Wallet and I don’t see me really switching from it, but the Gallery Wallet will probably be my second favorite wallet. I have heard that the Mandy is like a larger Betsy, so some of you who are looking for a little bit bigger bag should really like it! The other thing I have heard some excitement about is the e-reader sleeve. I don’t have an e-reader, so I cant share your excitement, but it does seem like a great idea. I still only have one piece of microfiber (Clutch purse) but I really like it. Some occasions just call for a solid purse. 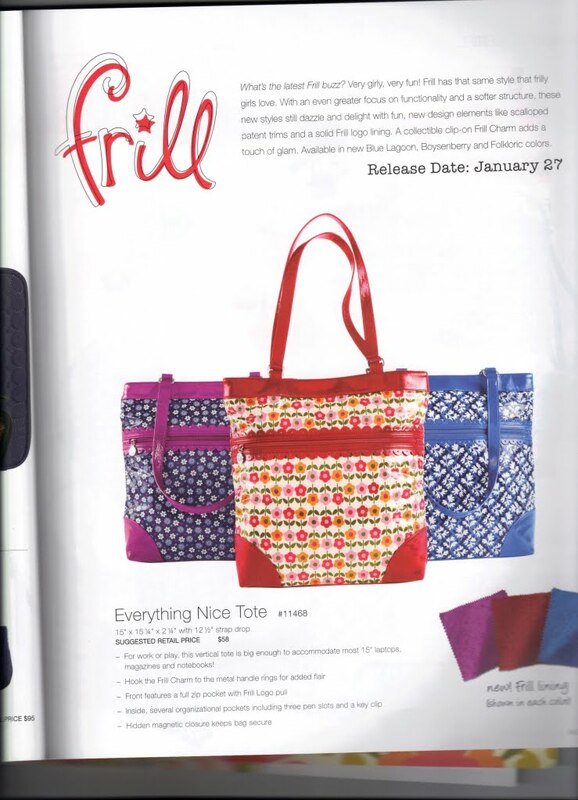 I am loooving the Convertible Tote, but not its price tag ($100). A girl can hope though, but with Christmas just passing and my birthday being in November there isnt a lot of hope that this one will be gifted to me. Might just have to save up or wait until it goes on sale. 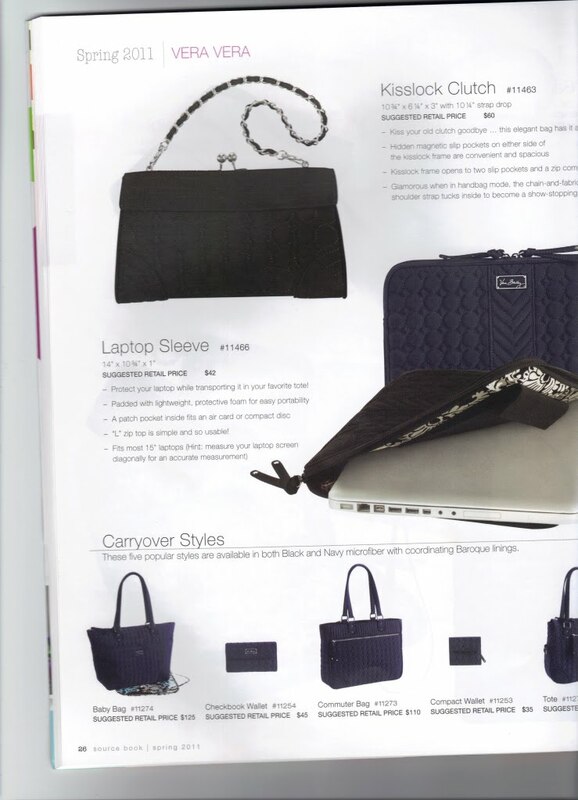 Ummm…did you see the Belt Bag ($42) ?! I like the bullet point that says, “Belt bags are back!” Well maybe I am out of touch, but in San Diego, Belt Bags are not back. I wouldn’t be caught dead with one. (Although I do wear a hiking one for the 3 Day walk, that is totally different though) Maybe it is for the older crowd? I just don’t get it. I have never really been a huge fan of Frill. 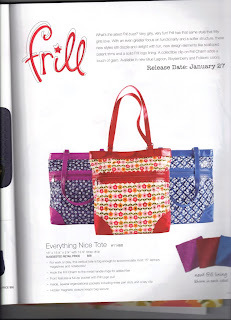 It isnt that I don’t like it, I think that I just like other bags more, so I haven’t really purchased anything from the Frill line. All I have is a little Charm Pouch. I do like the Everything Nice Tote ($58), but I think that I will hold out to get a different tote. One thing to point out about the Frill line is that it will now be lined with a solid color and not the coordinating outside print. 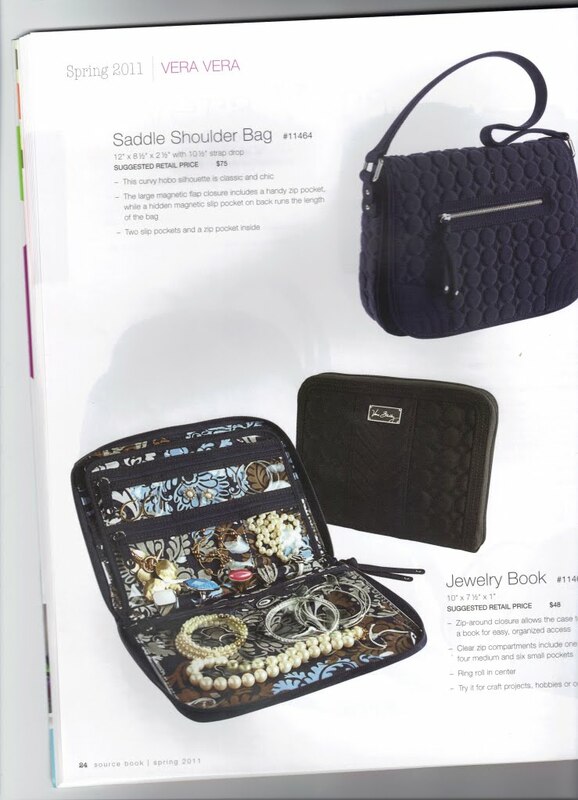 I am excited about the Jewelry Roll ($35), they are really cute and I think that they will work perfect for my weekend trips to go visit friends. I have a Jewelry case that I really like, but sometimes it doesn’t hold everything that I want. So maybe if I used both it would work out perfect. I don’t really care for the Jewelry Box, my stuff moves around too much and ends up one big jumbled mess, so I just use it on my dresser and not for traveling. They are also coming out with a Tech Pocket ($18). I wonder if they are planning on retiring the Tech Case ($22) or if this is just going to be a one time offer since they are lumping it in with the Limited Edition Accessories. For a girl who lives in San Diego you would be surprised how often I go to the beach…NEVER. I think that it has to do with my pale white skin. It just takes way too much effort to put on sun screen and then stay all covered up at the beach. Plus sand gets everywhere and I swear that I still find sand in my car, house, etc a week later. But regardless, I am excited about the In The Clear bags. I really like the Resort Tote ($58) and the fact that is has a removable clear pocket for your keys, cell phone, whatever you want to keep safe from water and sand. Plus they would be super easy to clean. I will be buying the Large Tote ($68). I think that this will be a great tote bag and I love the piping on it. They are also going to have a smaller version, but I didn’t post that picture because it didn’t scan the whole page, so it looks funny. I think that I am just craving a solid colored bag. Super cute and sporty, but I think that I am going to pass on this one too. 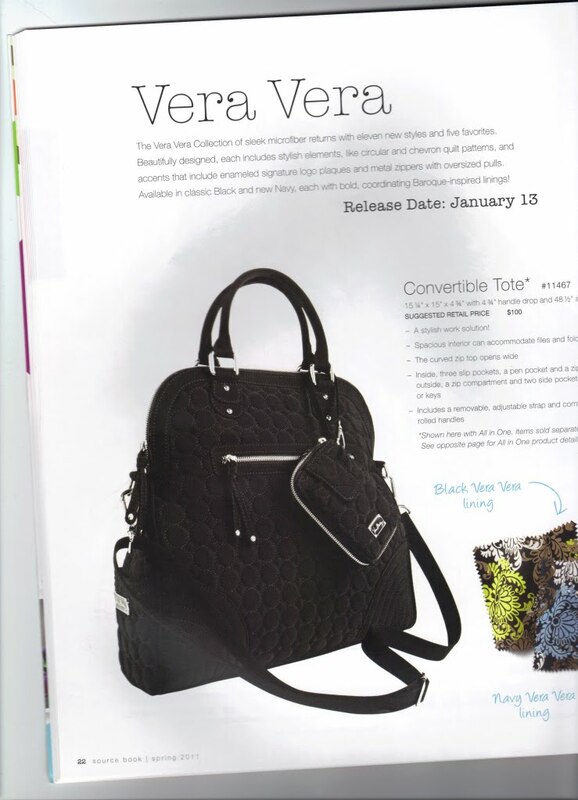 My top 3 picks are the Vera Vera Convertible Tote, Dockside Canvas Large Tote and the Limited Edition Jewelry Roll. I can’t wait to see them in person! I hope that they are everything that I am hoping they are. And if I can stick to just liking those 3 things, it would be great because that would be one item a month in the Spring. Not too shabby. Guess I should get busy on ebay now! What are you most excited about in the Spring? Click here for the 1st set of Source Book Pics. Click here for the 2nd set of Source Book Pics.